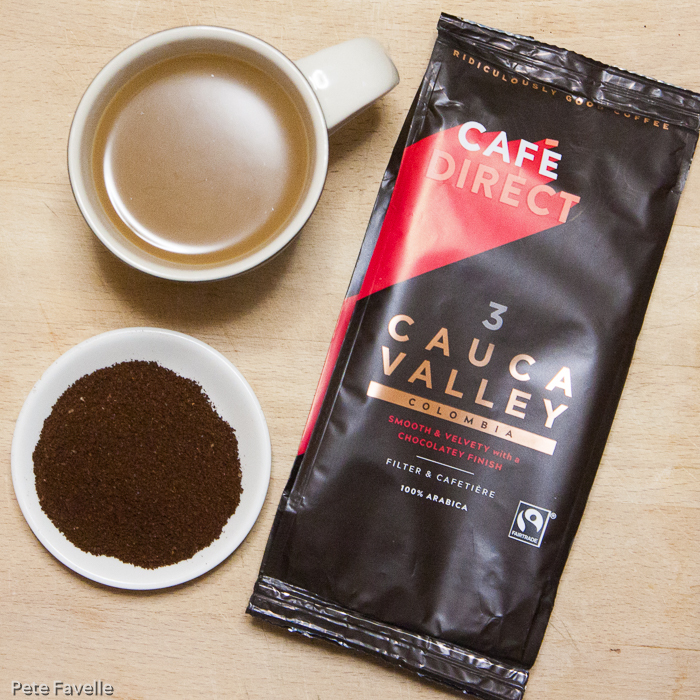 Continuing our exploration of CaféDirect’s revamped range, and we head a little south, onto the South American continent itself. We’ve encountered Colombian coffee from CaféDirect before, but I suspect there has been a little reformulation to go with the rebranding – the strength rating has been nudged down from a 4 to a 3, and aroma definitely has less sweetness to it. Cauca Valley is a Colombian coffee, grown in the South Cauca region in the west of Colombia, not too far from the border with Ecuador. The grounds have a rich, fruity aroma – chocolate dipped black cherries with a gentle melon acidity beneath and even a faint hint of fresh tobacco. Brewed, the aroma loses the fruit and becomes drier; there is still some tobacco and the chocolate notes become more cocoa powder. In the mouth, it’s subtle; a little dark fruit which is nicely balanced by a background of tannic acidity, and a very smooth character. There’s a pleasing, gentle dryness to the finish and its a very satisfying drink. The flavours lack the punch to be exciting, but aside from that there isn’t much to fault. 3.5 stars.